How to Root Micromax Yu Yureka Smartphone with CyanogenMod OS 11 using CWM Recovery? Do you want to know how to root Micromax Yu Yureka smartphone? Here's a step by step guide to root the Micromax Yu Yureka smartphone with CyanogenMod OS by unlocking bootloader, installing CWM recovery and flashing SuperSU file. So, buy your Micromax Yu Yureka smartphone online and follow the rooting tutorial guide listed in this article below. Tech-savvy people generally opt for low-range smartphones with great specifications and then try out different custom ROMs and rooted apps after rooting the device. Rooting smartphones is beneficial to such users who want more out of their device i.e. beyond the limitations provided by the smartphone manufacturers. However, they risk losing the manufacturer warranty period offered for their respective mobile phone as most manufacturers clearly state that problems encountered post rooting are not covered within the warranty period. So, many people try to root their smartphones (which unlocks the phone completely) after their warranty period is over. 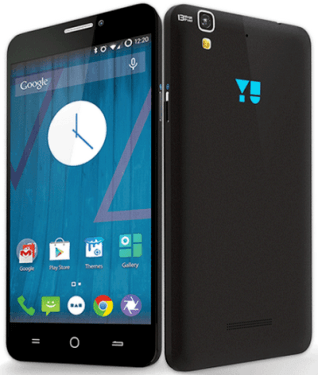 With the latest release of Micromax Yu Yureka smartphone accompanied by CyanogenMod OS 11 (based on Kitkat Android 4.4. ), the warranty would continue to exist even after this Yureka phone is rooted. This is an ideal scenario for people who love rooting their mobile phones. This Yureka Cyanogen OS phone is the latest from Micromax and it has also been made available in India. In this article, you can learn how to root Micromax Yu Yureka smartphone running on CyanogenMod OS by unlocking bootloader and using CWM recovery. In other words, lets check out the tutorial guide to root MMX Yu Yureka smartphone enabling users to play around with the CyanogenMod Operating System. First and foremost thing is to check that your MMX phone is covered under the warranty period. Secondly, make sure your Yu Yureka Micromax phone has battery percentage of atleast 40% to survive the entire rooting procedure. Last, but not the least, take appropriate full back-up of all data on your Micromax smartphone and keep it in a secured place. This last requirement is a must as rooting will format internal memory of your phone and wipe out all data. The three major steps to root Micromax Yu Yureka Cyanogen smartphone are to unlock the bootloader, flash/install CWM (ClockWorkMod) recovery and finally flash SuperSu zip file. Install Android ADB drivers (15 second ADB installer) from the Android XDA link http://androidxda.com/download-best-android-adb-driver on your Windows computer. Later, download the CWM recovery (root package) on your PC from the link https://s.basketbuild.com/devs/vishal_android_freak/yu/yureka. Extract the files to a suitable folder. When extracted, the root package will contain files as seen below. Next, switch off your smartphone and connect it to the computer using a USB cable. As soon as this is done, you would observe that the LED near the speaker at the top glows red. Now, keep the "Volume Up" button pressed. Open the extracted root files on your PC. Then hold down the "Shift" key and right-click on empty space of your PC screen to choose the option "Open command prompt window here". 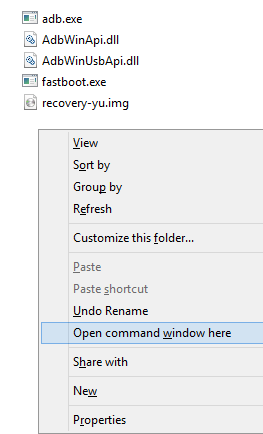 Type the following command in the command prompt window that gets opened and press the "Enter" key. This will result in removal/deletion of all personal data including internal memory of the smartphone. This is how you can successfully unlock the bootloader for Yu Yureka phone. Successful execution of the above command would flash CWM recovery on your MMX Yu Yureka mobile phone. If at any point of time, you need to access this CWM mode, you simply have to press-hold the Volume Up button, Volume Down button and Power button. As of now, there is no need to access this CWM mode. We'll now move towards the last part of this rooting process i.e. flashing the SuperSu zip file. You can download the latest SuperSu zip file here: http://i6.androidxda.com/data/SuperSU.zip. You can easily copy or move this downloaded SuperSU file to your smartphone's SD memory. Then, switch off your phone and boot in CWM recovery mode by simply pressing (for few seconds) together Volume Up button, Volume Down button and Power button. In this CWM recovery mode, you need to press the power button to select "Install Zip from SD card" option followed by "Choose it from internal SD card" option. You can now select the SuperSU.zip file through pressing of the power button. Once all the flashing is over i.e. all files installed, you can continue to reboot the device through CWM mode. 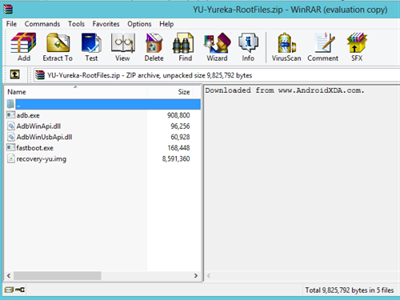 This shall complete the process of rooting your Yu Yureka smartphone. How to check if Micromax Yu Yureka smartphone was rooted correctly? To check if your phone was successfully rooted, search for SuperSU app on your applications menu of the phone. If this app is present, the rooting was indeed successful. Alternatively, you can download the "Root Checker" application from Google Play Store and check your smartphone's root status. Hope you will now be able to take your own decision before going for the rooting of this smartphone. Special thanks to Vishal Android XDA developer (vishal_androidfreak) from AndroidXDA for the CWM recovery file and his URL is accessible at: http://forum.xda-developers.com/yureka/orig-development/recovery-cwm-based-recovery-v6-0-5-1-t3001339. That's really an excellent piece of information. Instead of depending on the unnecessary and unreliable tutorials available on the Internet, you have given the source files from the most trusted xda developers site. Simple and lucid step by step information is truly helpful. Will I get the official OTA updates after unlocking bootloader or rooting my YU YUREKA?